This November, Lucky247 casino is doing its bit for charity by launching promos and prizes related to the Movember movement. All month the casino will be dishing out jaw-droppingly high prizes and adding surprise bonuses to all of your favourite Lucky247 games. One of the most impressive ways Movember is being celebrated on the site is Mo-Like, Mo-Share, Mo-Win. This exciting promotion gives players the chance to win one of the biggest rewards the site has to offer. This promo is active from the 7th to the 28th of November. During this time, all players who opt in to the promo will be entered into the prize draw for the grand prize- a luxury gift basket worth £250- just in time for Christmas! As if that wasn’t enough, everyone who likes and shares Facebook posts about the competition will automatically be treated to 10 free spins on Wild Orient. This popular Microgaming slot adds an exotic eastern twist to the 243-ways-to-win format, which is quickly becoming a favourite among keen slot players. 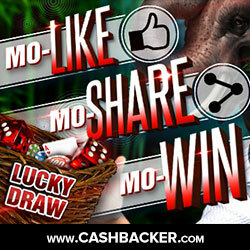 If you like the sound of winning a lavish gift basket and playing some free spins, you’ll be happy to hear that you can easily qualify for Mo-Like, Mo-Share, Mo-Win. To start with, you have to like the Lucky247 Facebook page and share any posts you see with the ‘Mo-Like, Mo-Share, Mo-Win’ banner along the top. To claim the second part of this bonus promotion, you must deposit £20 or more to your Lucky247 account any time during the promotional period. Remember to click the link below to be eligible for a £250 welcome bonus and our exclusive 10% lifetime cashback . Then, get in touch with a member of staff via email, telephone or the live chat feature and claim your free spins. It will take just a few minutes for your free spins to appear in your funds. Once you’ve liked and shared the posts and played through your free spins, you will automatically be entered into the prize draw. It’s important to note that the promotion is only open to registered members of Lucky247 casino who have made at least one cash deposit previously. To qualify for the prize draw you must follow the steps above and contact support staff with either a link to your Facebook page or a screen-shot of the shared post on your page. Any wins you make with the bonus free spins at Wild Orient will be subject to a 50X play-through before you can convert them into real money.